As published by the Stratford Beacon Herald, February 19, 2015. By Mike Beitz, The Beacon Herald. 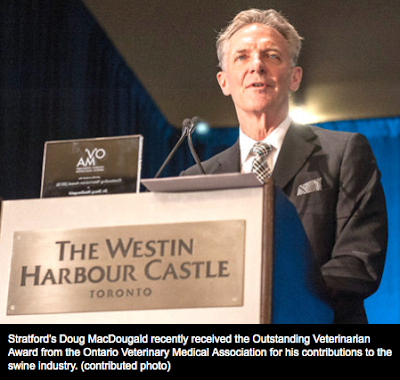 Doug MacDougald’s significant contributions to the swine industry have earned him a prestigious award from the Ontario Veterinary Medical Association (OVMA). The local vet, who practises with South West Ontario Veterinary Services in Stratford, recently received the Outstanding Veterinarian Award from the OVMA at its annual conference in Toronto. “It’s always nice to be honoured by your peers,” said MacDougald Wednesday. He was nominated for the award specifically for his dedication to the swine industry, and the key role he played in addressing porcine epidemic diarrhea (PED), a disease that has killed millions of piglets in the U.S. but is largely contained in Canada. MacDougald and his fellow veterinarians have been working together, sharing information and taking a proactive approach in an effort to stamp out PED in the province. The award acknowledges that teamwork, suggested MacDougald, who is also a founding member and current chair of the Ontario Swine Health Advisory Board. “I think it recognizes the collaborative effort the entire swine industry has done with our approach to disease control and PED,” he said. The approach appears to be working. Almost all of the cases of PED that occurred last winter and spring have been eliminated, said MacDougald, and there have been “a relatively small number of cases” since the fall. Cold weather increases the risk of PED being spread. MacDougald said he shares the Outstanding Veterinarian award with his colleagues. The award also recognizes MacDougald’s work in the community, as well as his involvement with the Canadian-based charity Sleeping Children Around the World. In April, he will be heading to Togo in West Africa with that charity to lead a team of volunteers that will distribute mosquito nets, bed kits and other basic supplies to children from impoverished families.